Diversity News Magazine Special Spring and Summer 2015 Featuring Hollywood Walk of Fame Star and Recipient, The Young and the Restless Star Actress Kate Linder. On April 1, 2015, Diversity News Publications, publisher of Diversity News Magazine unveiled the release of their Special Print Edition Magazine for the Spring and Summer 2015 Featuring The Young and the Restless Star Kate Linder. Kate Linder is an actress, activist, humanitarian & Hollywood Walk of Fame Star Recipient. “I’m so honored to be on the cover page of the Diversity News Magazine special print edition. What a wonderful way to celebrate my 33rd year on “The Young and the Restless” and 8th anniversary of receiving a star on the Hollywood Walk of Fame. I couldn’t be more delighted, especially because all of this allows me the privilege of bringing more attention to my favorite charities, from The ALS Association and the Los Angeles Mission to the charity teas we do with my generous castmates from “The Young and the Restless” in Canada for both the Canadian Cancer Society and for the March of Dimes Canada’s Conductive Education® (CE) program.” said actress Kate Linder. As we promised our loyal fans and readers in our January 2015 press release spoiler, the next issue, scheduled to be available in print in April 2015, will feature a familiar celebrity. We hope to continue reaching out to important celebrities and powerful newsmakers and shakers to embrace our magazine covers. “In this issue we honor and feature a Hollywood Star that cares and is a loving daughter and wife. She is “The Young and the Restless” actress, activist, and STAR Kate Linder, and receives this honor because of the hard work she does to give back to our community. We really need more people like her in this world.” said Steven Escobar, President and Executive Editor-In-Chief of Diversity News Magazine and President of Diversity News Publications. To find out why our team decided to feature actress Kate Linder on the front cover of our special print magazine you must order your print or digital copy of the Spring and Summer 2015 Special Print Issue. “I want to thank our own Creative and Graphic Design Director Sylvia Johnson Kittrell from Sylvia’s Graphic Creations for working so hard to make our Special Spring/Summer Print Edition cover page perfect. Also thank you to our own Linda Krongold for always being willing to work with tight deadlines and properly edit everything we write to make us look good. I am so happy with the current active team that we have working at Diversity News Magazine.” concluded Mr. Escobar. The feedback that Diversity News Magazine has received from its fans, readers and colleagues has been very amazing. Some colleagues stated that the magazine is becoming a stronger in the industry by featuring a star like actress Kate Linder. Anyone who buys the print version will get Free Digital (Digital version is a PDF) with Print Purchase, a savings of $7.99. 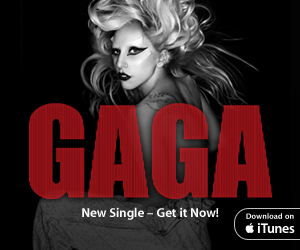 Remember by purchasing the magazine, you are supporting a team to continue publishing the magazine. You can help them to continue publishing the magazine by sponsoring pages. 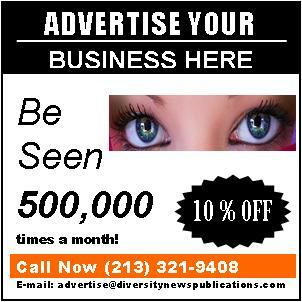 You can contact President and Executive Editor-In-Chief Steven Escobar at editor@diversitynewsmagazine.com to find out how you can get involved and help with sponsorship opportunities. Diversity News Magazine Special Print Spring and Summer 2015 Edition Featuring The Young and the Restless Star Kate Linder. Kate Linder is an actress, activist, humanitarian & Hollywood Walk of Fame Star Recipient. Diversity News Publications, publisher of Diversity News Magazine announced the release of their Special Birthday and Holiday Print Issue Featuring their Own Stella Gomez, Photographer, Writer and Reporter. Diversity News Magazine Special Print Edition was published on December 30, 2014. To find out why our team decided to featured on the front cover of our special print magazine Stella Gomez. You need to order your print or digital copies of the Special Birthday and Holiday Print Issue. “This Special Birthday and Holiday Print Issue is very special graphic artist Saman Dameshghi who is a very independent graphic designer.”said Steven Escobar, President and Executive Editor-In-Chief of Diversity News Magazine and President of Diversity News Publications. An spoiler news for their loyal fans and readers, the next issue which is schedule to be available in print on April 2015 will featured an B familiar celebrity. 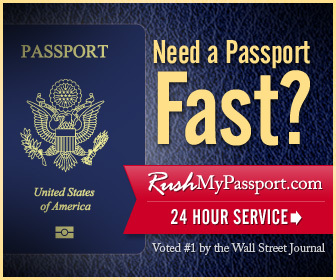 “I am happy to work with Saman Dameshghi and his staff to make our magazine better every time. I thanks her for the feedback and collaboration.” concluded Mr. Escobar. 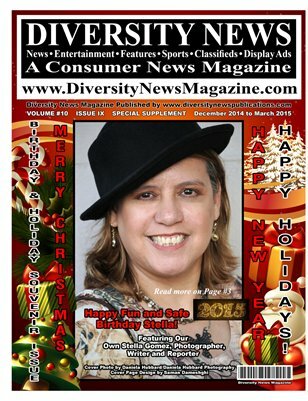 Diversity News Magazine Special Birthday and Holiday Issue Featuring Our Own Stella Gomez, Photographer, Writer and Reporter. Also this is our Diversity News Magazine Special Print Holiday Issue. Please see the birthday wishes, Merry Christmas and Happy New Year 2015 from various organizations and individuals. Any one who buys the print version will get Free Digital (Digital version is a PDF) with Print Purchase! that is a savings of $5.00 Remember by purchasing the magazine, you are supporting their team work to continue publishing the magazine. You can help them to continue publishing the magazine by sponsoring some pages. Contact President and Executive Editor-In-Chief Steven Escobar at editor@diversitynewsmagazine.com on how you can help with sponsorship. ORDER YOUR COPY NOW AND OWN A LITTLE PIECE AND PART OF DIVERSITY NEWS MAGAZINE. As of 4/30/2013 the magazine was published on MagCloud (To buy it go now to: http://www.magcloud.com/browse/issue/556980). 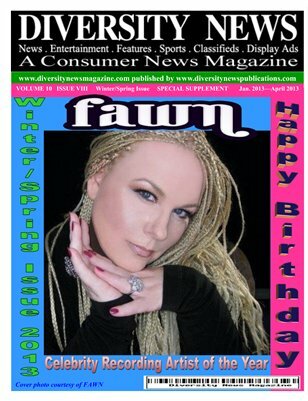 Please remember to read and find out why our team decided to featured on the front cover of our special magazine Celebrity Recording Artist FAWN. The magazine is published in partnership with Hewlett-Packard Development Company, LP. MagCloud and is available to be order in print for $8.99 or digital for $3.57, or just get both for$8.99, just click http://www.magcloud.com/browse/issue/556980 or visit Diversity News Magazine for the entire collection at http://diversitynewsmagazine.com/aboutus/special-print-magazine/#.UO5l9299LSg. Any one who buys the print version will get Free Digital (Digital version is a PDF) with Print Purchase! that is a savings of $3.57. Remember to support our team work by placing your orders today. Diversity News Magazine Special Print Edition is designed and edited by Steven Escobar for Diversity News Printing Services, a division of Diversity News Publications.